Somestimes I am amazed to find similarity between cuisines form different culture. Kofta and Meat Ball are actually same thing, just use of different spices. 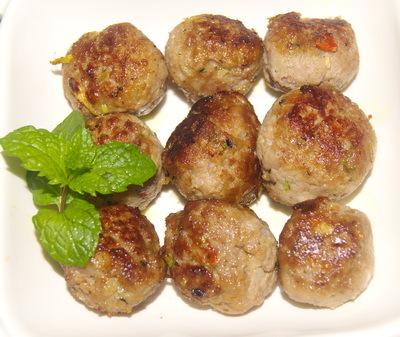 Kofta / spicy meat ball is very easy and handy recipe. Hope you will find interesting too. You can use mince but I like to make make it. 1. Add all ingredients except oil in food processor and mix well. 2. Make balls with it. 3. Heat the pan with oil and fry kofta till it becomes golden brown. 4. Serve kofta as snacks or as a side dish. I am very glad to receive your Bangla recipe and also many thanks for that. Can you tell me why my meatballs/kofta/chapli kabab always shrinks when i put them in the pan–even if i put bread crumbs on them..i noticed in this recipe you omitted bread crumbs. any advice? thanks! Reason for shrinking kabab, your kabab mince is too dry and lean (and using bread crumb will make dry), add moisture in it, like onion and bit of oil, then you will get perfect kabab. I used bread instead of bread crumb, if my mince has lots water then I would use bread crumbs. Lean mince is healthy but it makes your kabab to shrink and dry.